A large Mississippian settlement was situated on the west bank of the Mississippi River at the location that would become the City of St. Louis. 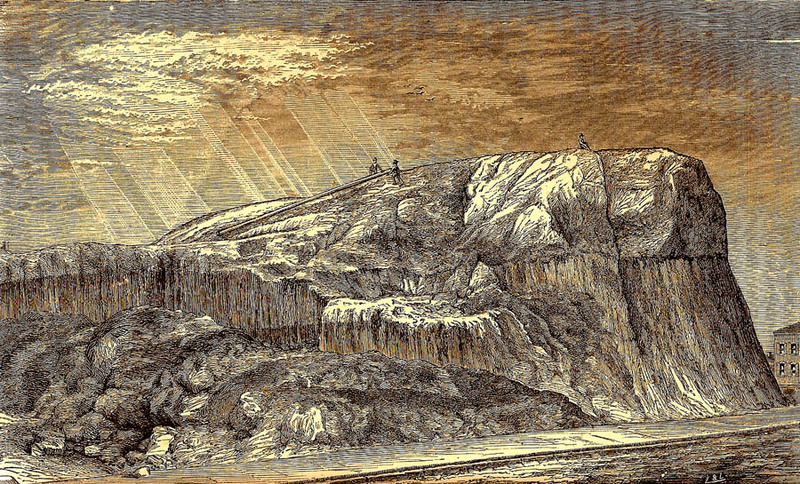 Drawing published by Conant (1879:44) entitled "Cross-Section of the Big Mound at St. Louis"
Drawing published by Conant (1869:frontpiece) entitled "The Big Mound at St. Louis, 1869." Location of St. Louis Mound group in relationship to the East St. Louis Mound group and Cahokia. 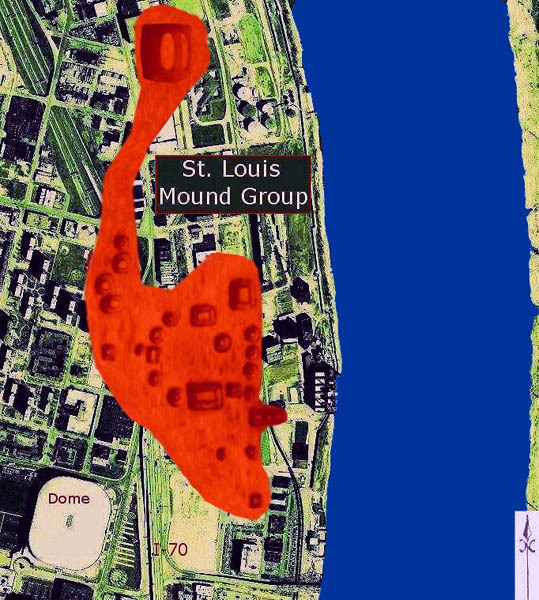 Overlay of the Mississippian mound group with modern streets, highways and buildings in downtown St. Louis, MO. Image provided by Mark Leach from the video documentary "Uncovering Ancient St. Louis" (2009). Computer reconstruction of the Falling Gardens Mound in downtown St. Louis, MO. Image provided by Mark Leach from the video documentary "Uncovering Ancient St. Louis" (2009). Computer reconstructed skyline of the St. Louis Mound Group in approximately AD 1100. Image provided by Mark Leach from the video documentary "Uncovering Ancient St. Louis" (2009). 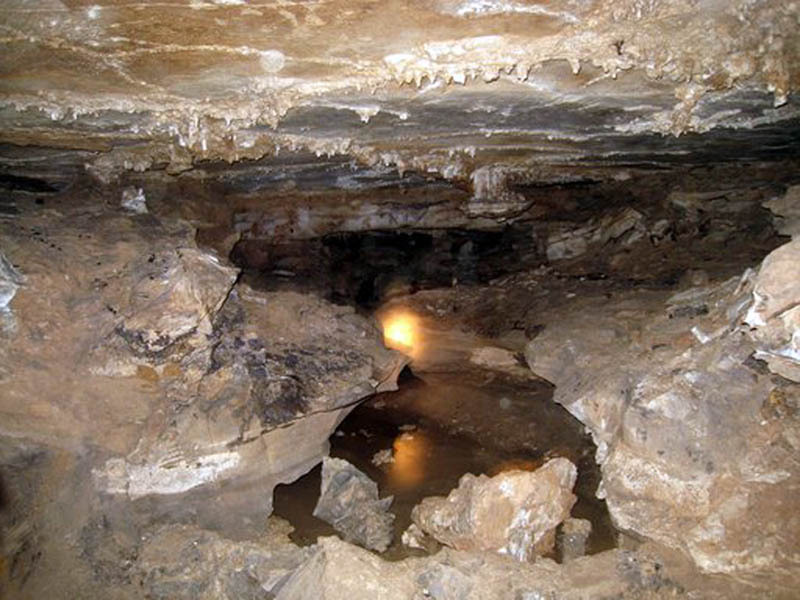 Interior of Cherokee Cave near the St. Louis Mound group. 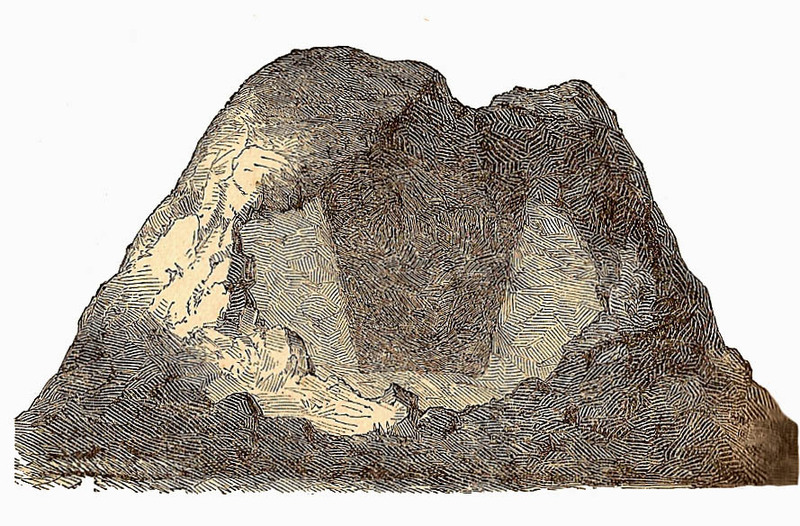 The close relationship between the extensive cave system and the mounds is not accidental. One function of the mounds was to honor and protect the caves that were probably seen as the dwellings for various spirit creatures. 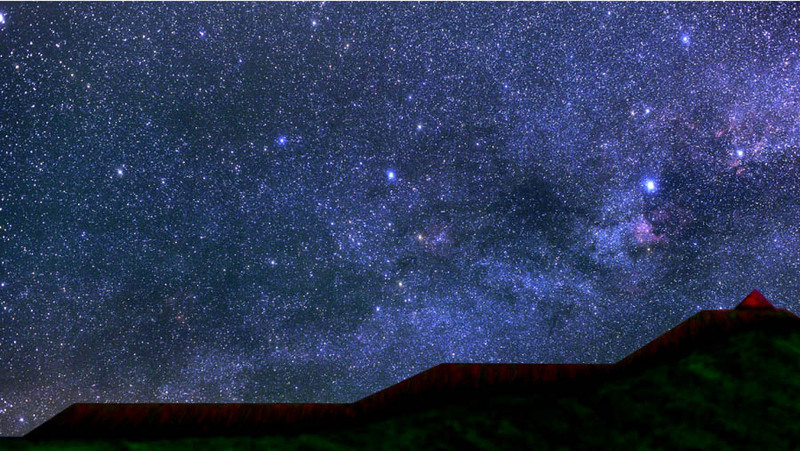 Image provided by Mark Leach from the video documentary "Uncovering Ancient St. Louis" (2009). 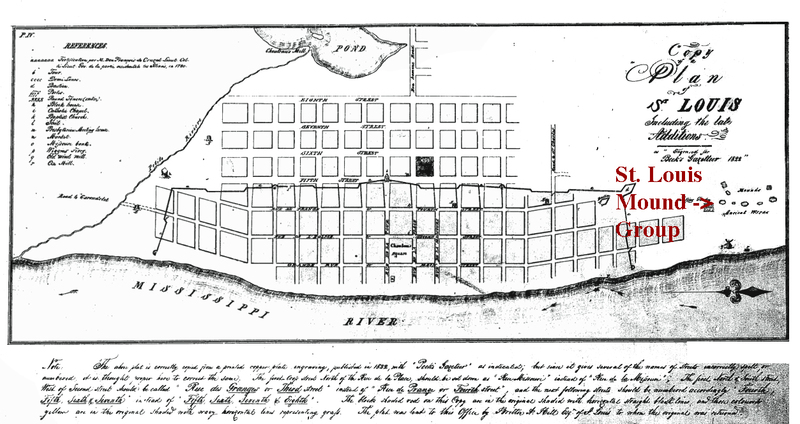 The oldest known map of the St. Louis Mound Group prepared in 1819 by T. R. Peale. The rectangular pattern around mound 27 in the northwest quarter of the mound group probably represents a fortification ditch. Enlarged and enhanced from 7200683b03.pdf provided by the Land Records Repository - Missouri Department of Natural Resources. 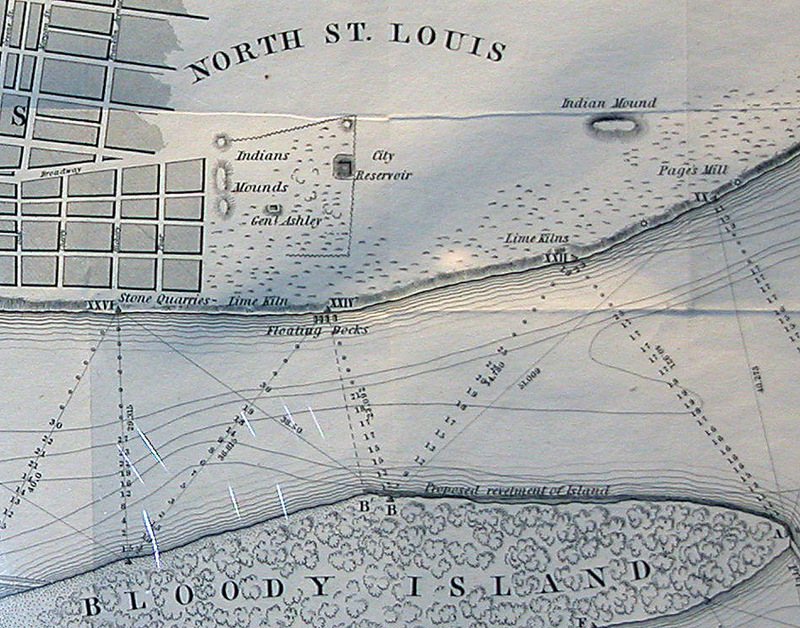 1822 map by Beck showing the St. Louis Mound group just north of the city boundaries. Map enhanced from 7200683b03.pdf provided by the Land Records Repository - Missouri Department of Natural Resources. 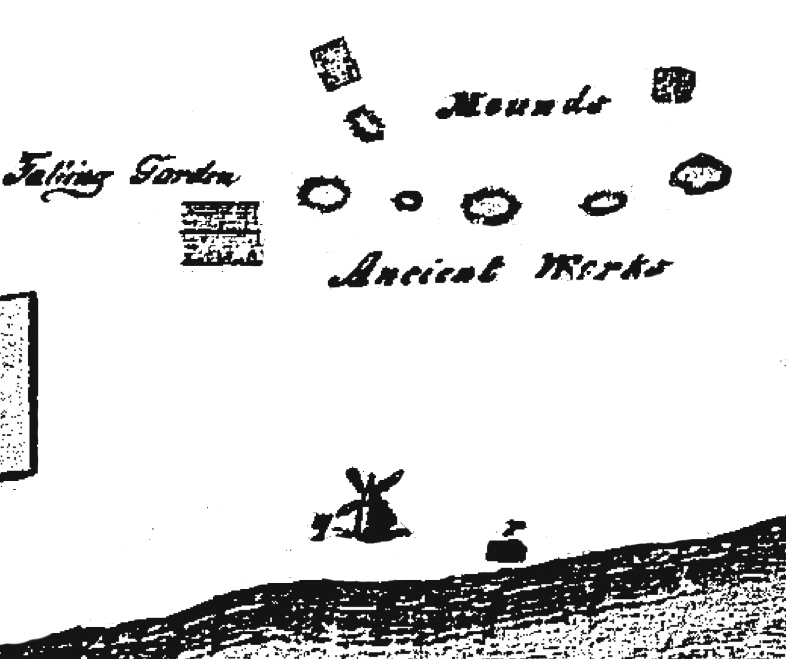 Closeup of the 1822 map by Beck showing the St. Louis Mound group and two mills just to the east of the mounds. It is possible that the irregular shape of mound 11 reflects a ramp on the east side and maybe to the west side. Map enhanced from 7200683b03.pdf provided by the Land Records Repository - Missouri Department of Natural Resources. 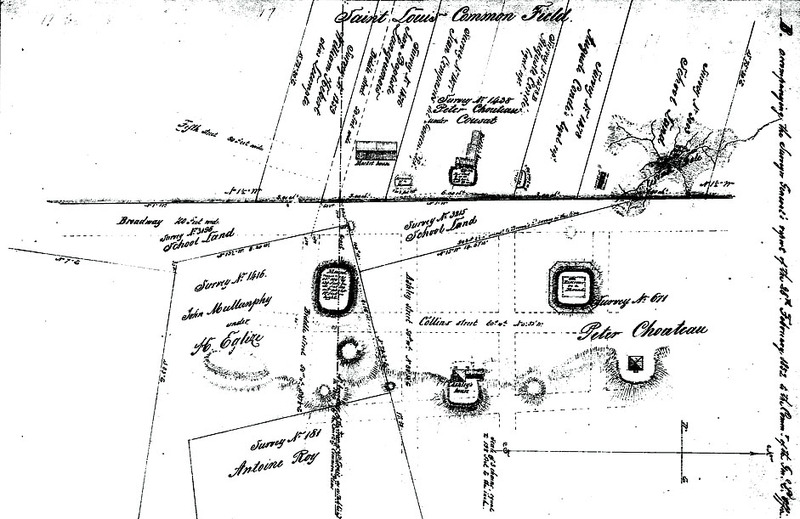 Map showing the St. Louis Mound group prepared by U. S. Army Engineer named Robert E. Lee in 1837 and published by the 25th Congress, 2nd Session, Senate Doc. #139. 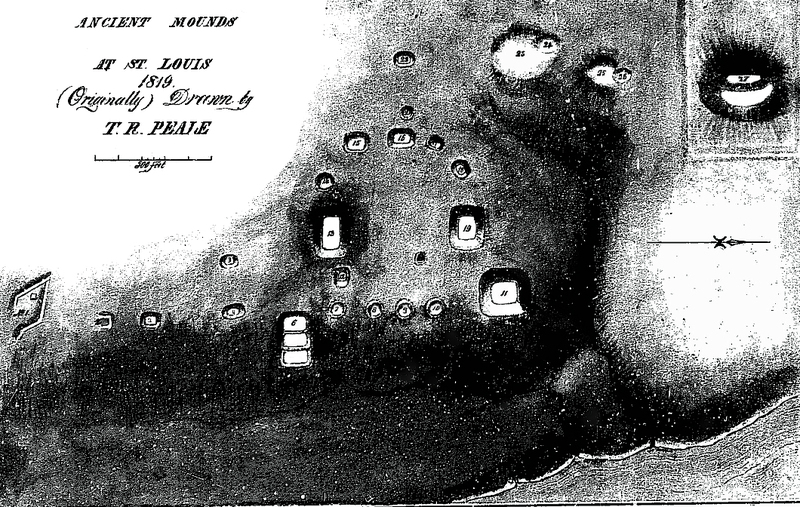 Map of 1852 showing a portion of the St. Louis Mound Group. Map enhanced from 7200682b01.pdf provided by the Land Records Repository - Missouri Department of Natural Resources. 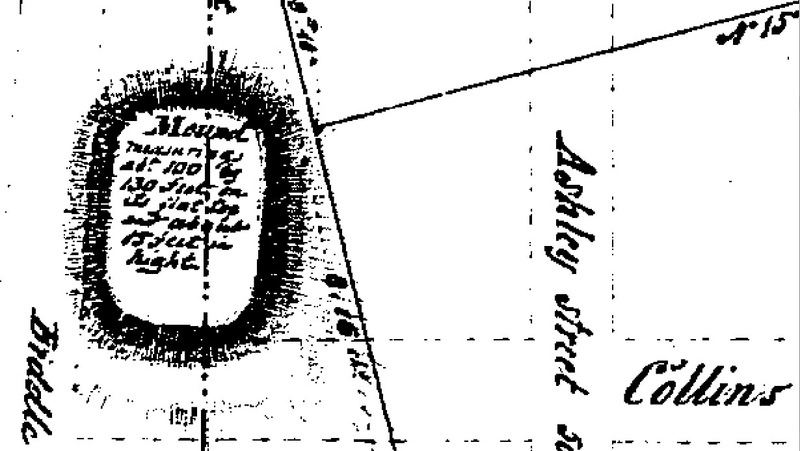 Large mound along Biddle Street pm tje 1852 map. "Mound measuring abt [about] 100 by 130 feet on its flat top and about 15 feet in hight [height]." Map enhanced from 7200682b01.pdf provided by the Land Records Repository - Missouri Department of Natural Resources. 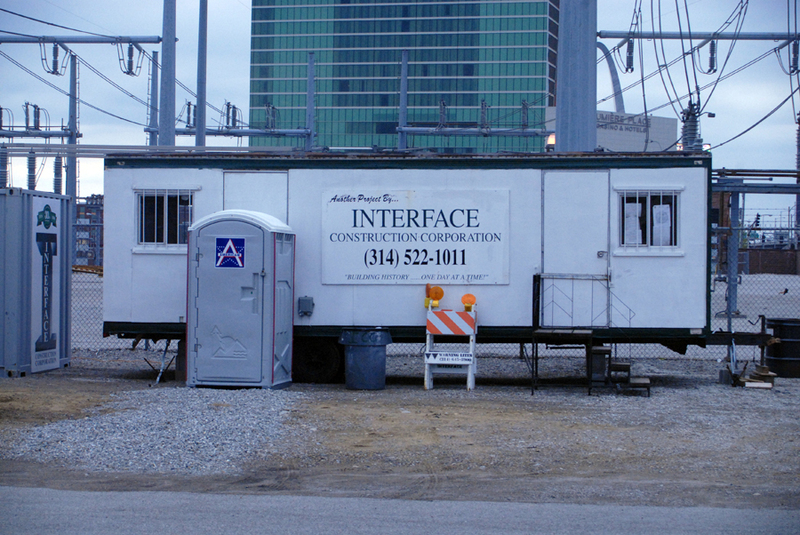 "Building history...one day at a time" on a construction trailor parked on the location of the St. Louis Mound group, April 2009. Modern construction work during April 2009 at the location of the St. Louis Mound group. This work was not monitored or inspected by local archaeologists even though several petitioned the construction firm, property owner, and the State Historic Preservation Officer. 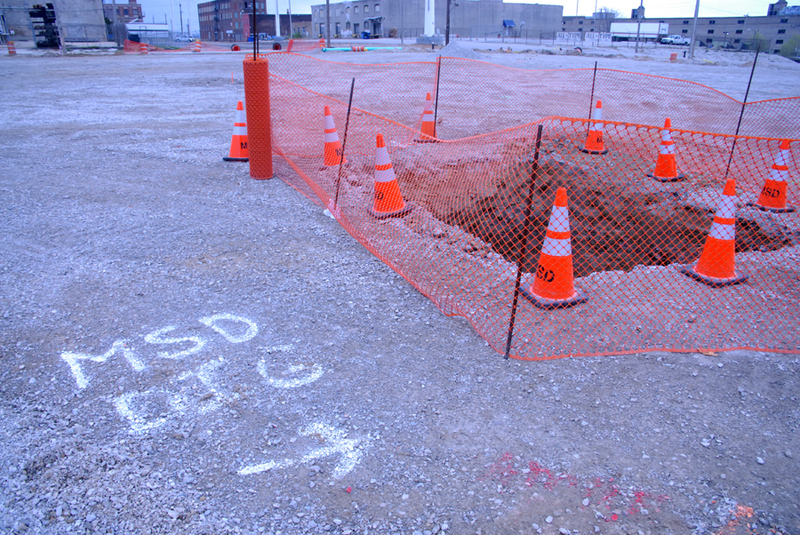 Deep construction trench during April 2009 at the location of the St. Louis Mound group. 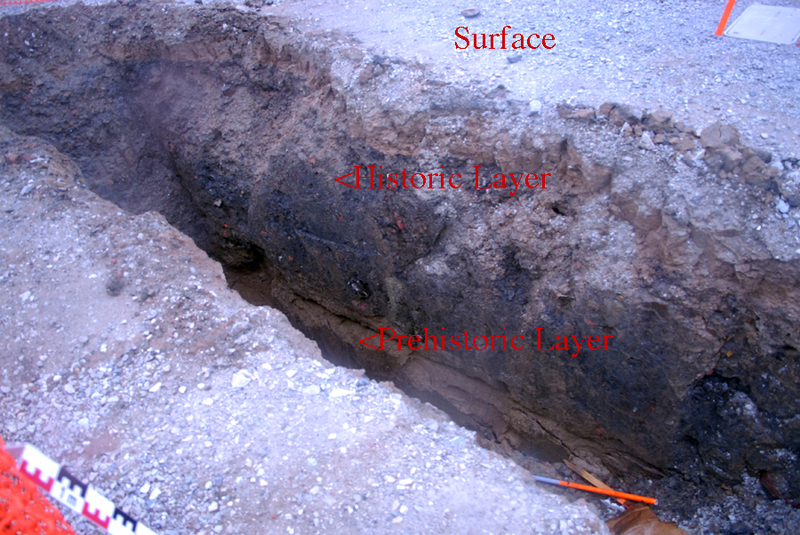 Two soil layers could be viewed from the edge of the street: a historic layer (19th and 20th century debris) and a Prehistoric layer. This work was not monitored or inspected by local archaeologists even though several petitioned the construction firm, property owner, and the State Historic Preservation Officer. 1870 Archaeology in Switzler's Illustrated History of Missouri from from 1541 to 1877. Edited by Chancy R. Barns. C. R. Barnes, St. Louis. Many thanks to Mark Leach for providing preview images of from the video Uncovering Ancient St. Louis. Special thanks to Daniel J. McGuire, Carol Payne	(Mo DNR Land Survey Section Chief) and Kristen Zapalac (Mo DNR - Historic Preservation Specialist) for helping track down the 19th century map of the mound group. Warm thanks to Neathery Fuller for her support in this researach. Many smiles to Ettus Hiatt for her help with text and content editing.